US Radon Management, Inc, was founded in 1988. The company's goal was to be more than a local radon contractor. The founders set out to provide a level of knowledge, expertise and quality of workmanship not otherwise available in the then-fledgling industry and to expand their services nationwide. The company became Radon & Water Control Systems, Inc. when waterborne systems and basement dewatering processes were added to the company's services. The dewatering services were discontinued, but the name continued in use until July 2000. In 1990 the company began to handle radon reduction management throughout the country by contracting with real estate and relocation service companies. A division, which later became known as RaTex, was set up to handle the management process, and a nationwide network of radon contractors was recruited to handle the local, on-site installations. RaTex was responsible for the radon reduction management for thousands of homes, handling the radon work for companies such as General Electric, AT&T, Pepsi and many others. In 2000, the corporate name was changed to US Radon Management, Inc, to reflect the company's full expansion as a national radon reduction company. Contractors who once were part of the network are becoming affiliates of US Radon Management, Inc , and where once a division handled nationwide radon reduction management, now the entire company focus is to design, install and service radon reduction systems nationwide. 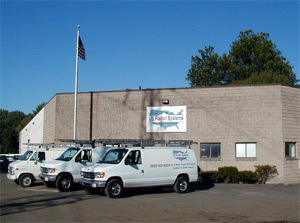 The local Connecticut service business continues to provide installations and service in Connecticut, Rhode Island and portions of Westchester and Rockland Counties in New York State. Since 1990 US Radon Management, Inc has served the radon and vapor intrusion needs of property owners throughout the United States, providing radon reduction and soil vapor intrusion within the 48 contiguous states. US Radon Management, Inc works with many National Relocations Companies, Multi-National Environmental Companies and Government Agencies including the EPA to insure proper system design and system installation with an emphasis on quality with obtaining the lowest achievable radon level as possible.